We don’t know about you, but for many of us, it was like one day we woke up and noticed everything – the fine lines, the discoloration, the beginning of age spots and the inability of our skin to just bounce back the way that it used to… and it hit like a ton of bricks. All of sudden, there wasn’t anything we wouldn’t try. Oh, to have that youthful essence forever! For those of us that have experienced this already, there are a plethora of products to choose from to tighten, plump, clear, fill and vanish. But it’s hard to know which are all marketing hype and which will work for us. 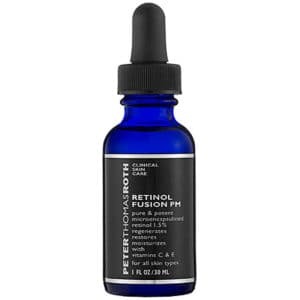 Retin-A, also known as Tretinoin, is part of the family of retinoids that is actually proven to fight the signs of aging, and even prevent them (if you want to delay that inevitable day we were talking about). Retin-A is one of the more aggressive derivatives of Vitamin A and it’s only attainable through prescription in the US and many other western countries. Experts agree that Retin-A boosts cell regeneration and collagen production, which are fundamental to slowing down the aging processes that affect your skin. It also combats skin concerns such as acne, environmental damage from sun and pollution, discoloration, texture, elasticity and fine lines and wrinkles. In this article, we’ll explore the changes you can expect before and after Retin-A usage. HOW YOUR SKIN CHANGES BEFORE AND AFTER RETIN-A? Retin-A helps with many of the concerns associated with aging skin, below we cover what it can treat and how quickly you can expect results. As we age, skin cells are not able to regenerate as quickly as they once did and the processes that help to remove dead skin cells and other impurities do not perform at the same levels they once did either. This causes the top layer of the Epidermis, the one wherein dead skin cells build up, to thicken. Combining this with environmental damage from UV rays and pollution that causes discoloration, your skin’s texture becomes uneven, rough and dull the older you get. Retin-A can help boost cell regeneration that slows with age while exfoliating away all the dead and dull skin cells that build upon the surface. This deep exfoliation can even contribute the reduction in discoloration and the effects of sun damage. Using Retin-A regularly, you can expect the skin texture and clarity to improve within 6-8 weeks of usage. As for discoloration, this will be corrected within several months. While that might seem like a long time, the overall benefits of Retin-A make it worth it. Another by-product of getting older – is decreased levels of elastin and collagen in your body. These are the proteins that cause your skin to stretch and contract. In more youthful days, your body produces collagen and elastin in abundance so that your skin is able to bounce back without issue. Compounding this, your body also retains less moisture as you age. So your skin becomes dehydrated more easily and loses elasticity. These two factors result in sagging skin that is especially visible under the eyes and in the formation of jowls. Well, Retin-A is beneficial for this aging concern as well! Retin-A is proven to effectively increase your skin’s stores of collagen and hyaluronic acid. By substituting these building blocks of firm and plump skin, Retin-A can improve elasticity and help the appearance of sagging. It will take up to three months to start noticing these effects but with continued use, you will see noticeable improvements for onwards of the next two years. Ok, so, the question we all want the answer to is obviously: how do we reduce the appearance of fine lines and wrinkles? Maybe equally as important, how do we prevent them? As we already mentioned, your body’s ability to produce collagen decreases and your skin becomes dehydrated as it loses its ability to retain moisture. This contributes to the formation of fine lines and wrinkles. If you’re looking to prevent and delay the appearance of fine lines and wrinkles, Retin-A’s collagen- and Hyaluronic Acid-boosting effects will slow down the rate at which you lose these with age. For those of us treating fine lines and wrinkles that have already made their way to our skin, Retin-A takes three to sixth months to reduce their appearance and six to twelve months for more advanced results in terms of deeper lines. 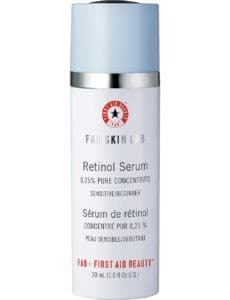 CAN RETIN-A SHRINK OR UNCLOG PORES? Age spots, which are also known as sun spots, can appear in increasing frequency as we age. These are those round, brown spots that predominantly appear on your face, neck, and arms, but can show up anywhere on the body. Caused by the excess production of melanin, or skin pigment, doctors aren’t sure why age spots develop. Some possible causes of excessed melanin include aging, sun exposure, and other UV exposure. Lucky enough for those of us struggling with this particular aspect of aging skin, Retin-A has a dramatically positive effect on age spots. Research indicates, Retin-A was shown to clear age spots in 80% of participants. By “clear” we mean fade or disappear. That’s some seriously effective stuff! In this study, researchers provided a series of photographs of a woman’s hand covered in brown liver spots. After forty weeks of treatment, all of the spots were faded or nearly vanished. Five months after this, the woman’s hand was completely free of all age spots! Researchers concluded that Retin-A’s effect on age spots is even more dramatic than the anti-wrinkle results. Primarily occurring in women, (only 10% of men will develop this skin condition), Melasma is a common skin problem that results in brown to gray-brown patches of skin, usually on the face. Melasma is caused by exposure to the sun’s harmful UV rays, a change in hormones (caused by changes in estrogen and/or progesterone, pregnancy, or hormone replacement therapy), and also irritated by skin care products. Retin-A acts as a cell-communicating agent that tells the skin cells to function properly and to regenerate on a healthy schedule. 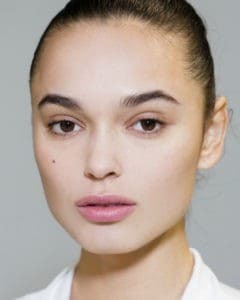 Healthy and regular cell turnover leave room for new skin cells, unaffected by pigmentation, to replace old skin cells. This removes pigmented cells from the surface and allows topical solutions to penetrate even more deeply. To realize the full potential of Retin-A’s effects on melasma, you’ll have to wait at least three months, and in some cases, as long as ten months. It’s important to continue using Retin-A regularly if you’re treating melasma – pigmentation issues will come back when you discontinue use. Although not quite an aging concern, acne and breakouts still affect many people well past adolescence. 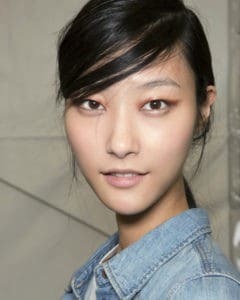 It’s also important to note that preventing acne and breakouts also prevents future discoloration and scarring. Acne and breakouts are linked to pores being clogged with oil, and Retin-A can help with this as well! It really is a miracle treatment. Retin-A is a powerful exfoliator which sheds dead skin cells that block pores and lead to pimples. It also decreases oil production, and excess sebum is often a major contributor to acne-prone skin. In the first four to six weeks, your skin will likely purge – causing breakouts and peeling, which is totally normal. In a matter of eight to twelve weeks, you should see significant improvement in your skin’s clarity. WHAT STRENGTH OF RETIN-A IS BEST FOR AGING CONCERNS? In the US and other western countries, you’re going to need a prescription for Retin-A. Don’t try to use it in larger or smaller quantities than prescribed as it can have adverse side effects if not used correctly. Like most prescriptions, the higher the dose you take, the more likely you’ll experience side effects, such as irritation, dryness and peeling. So whatever increases you do make, be sure to do it slowly and as recommended by your doctor. You also shouldn’t up the dosage when you miss a treatment – it’s better to skip treatments than to double up. Retin-A is generally available at three strengths, 0.025%, 0.05% as well as 0.1%. As a general rule of thumb at 0.05%, the cream is considered to be the best-matched variant for aging concerns but your doctor might start you at 0.025% in order to let your skin get used to it. Keep in mind though that stronger isn’t always better as the 0.1% may be too strong for most people and can cause severe irritation if you’re skin isn’t already used to using a retinoid. If you’re not quite ready to consider Retin-A then you can consider using Retinol, the over the counter form of Vitamin A that is also effective when treating aging concerns. 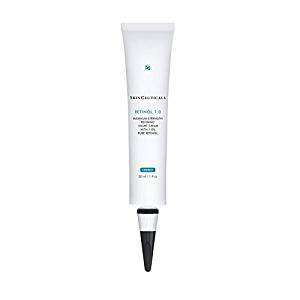 With 1% Retinol in its formula, this night cream will boost collagen production and encourage healthy cell regeneration to reduce signs of aging, the appearance of large pores as well as blemishes. This lightweight formula is soaked up by the skin almost instantly and leaves no greasy residue. If you feel that 1% will be strong for your skin consider trying the 0.5% ($64) variant. Jan Marini’s award-winning Retinol cream combines multiple skin-beneficial ingredients including Retinol, Peptides and various antioxidants to deliver maximum anti-aging results. With nightly usage expect improvement in skin texture, fine lines, and sun damage. 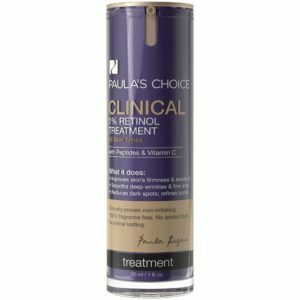 This Retinol formula has ingredients like Niacinamide (Vitamin B3) to help combat discoloration concerns as well as Vitamin E and Squalane to nourish. If you’re concerned about the strength of the formula it also comes in the gentler variations of 0.25% ($62) and 0.5% ($78) versions. Through combining Retinol and Advanced peptides, this serum is great for sensitive skin and those that are just getting familiar with Retinol products. Other key ingredients to minimize irritation and help sooth the skin include Vitamin E, an antioxidant, as well as Oatmeal. 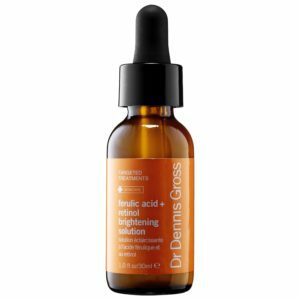 The inclusion of Ferulic Acid in this Retinol based serum helps boost the regenerative efforts. Other key ingredients include Arbutin & Licorice Root extract that aid the brightening efforts. The formula is also made without fragrance and is also cruelty-free (not tested on animals). Replenix’s 10X Retinol Serum combines Green Tea Extract and Hyulorunoic Acid that not only boost radiance but also neutralize free radicals. Recommended for tolerant skin because of its high dose of retinol, this serum will also target sagging skin and hyperpigmentation. If you’re concerned about the high strength, consider the 5X ($73.50), 3X ($67.50) and the gentlest, 2X ($58.80) variants. This light lotion melts right into your skin and has ingredients such as Oat, Burdock and Licorice extracts which help soothe and minimize the irritation associated with Retinol. With other powerful skin-beneficial ingredients like Hyaluronic Acid, Peptides a well as Vitamin C and E, this formula focuses is able to fight a number of aging concerns. 1.5% Retinol teams up with Vitamin C and E to not only combat the signs of aging but also soothe and moisturize the skin on your face. This powerful serum encourages healthy cell turnover to improve skins clarity and texture and reduce the appearance of lines. Make sure to check out our in-depth guide, before moving forward with treating your skin with Retin-A that covers more about what the cream does and how to incorporate it into your anti-aging skincare routine. In order to realize the best results that Retin-A offers, you’ll have to use it long-term. As we’ve mentioned, most of the positive effects of Retin-A take three or months to appear. But fear not! Although it’s a significant amount of time to invest, Retin-A promises to treat your anti-aging concerns (plus more) and is actually proven to give amazing results – unlike a lot of the alternatives out there. But don’t forget that when you discontinue use, discoloration, melasma, and acne can return. With that said, we should also mention that it is possible for your skin to get used to Retin-A. When that happens you have essentially two options: first, you can up the percentage of Retin- that you are using (make sure you do so after consulting with your doctor); or, you can take a break from using Retin-A for a few months at a time. While you can’t stop the hands of time as yet (scientists are working on that though)—you can work to prevent and delay the visible signs of aging. Retin-A, is considered the gold standard and performs very well when compared to most alternatives out there. In fact, Retin-A might be the answer you’ve been looking for your whole life – or at least since that day you woke up and noticed you were no longer 21 so it’s definitely worth giving it a try.